Guest post: a new tyrannosaur – Alioramus altai. One of the great perks of studying at the American Museum of Natural History, and being a student of Mark Norell’s, is the material. Fossil material, and lots of it. Every year Mark and Mike Novacek trek to the Gobi Desert of Mongolia and scour the famous Late Cretaceous redbeds bursting with skeletons of Protoceratops, Velociraptor, Tarbosaurus, and many other famous dinosaurs. The AMNH team has been traveling to the Gobi for 20 years now, and the specimens keep on coming. Two decades of hard, back-breaking work in some of the world’s hottest climates have paid off. The Campanian and Maastrichtian dinosaur faunas of the Gobi are now among the best understood in the entire world. When I began my PhD at the AMNH last fall Mark handed me an amazing specimen. The preservation, and the preparation job, was the best of any dinosaur fossil I had ever seen. Subtle details of the neurovascular foramina and antorbital fenestra and skeletal pneumaticity, and countless other wonderful things that are hardly ever preserved on dinosaur bones, were preserved in immaculate condition. And much of the skeleton was there, too. A nearly complete skull, missing just a few minor bones. A complete neck and large segments of the back, sacrum, and tail. A nearly complete pelvis and most of the hindlimbs. And, perhaps most spectacularly of all, the specimen was a tyrannosaur. Not just any dinosaur, but one of the best preserved fossils of one of the most familiar and celebrated groups of extinct vertebrates. Lucky me! The Alioramus altai skull. Image courtest of Steve Brusatte, created by Frank Ippolito (AMNH). Over the past year I have meticulously studied this fossil, working with Mark Norell, Thomas Carr (one of the world’s foremost tyrannosaur experts), Gabe Bever (a postdoc at the AMNH), and Greg Erickson (Mr. Dinosaur Histology). Today, our first paper on the fossil, a short description, is published in Proceedings of the National Academy of Sciences. And it turns out that the fossil has a pretty cool story to tell. The new skeleton is the first good fossil of the long mysterious tyrannosaur Alioramus. This puzzling genus is only known from one other fossil in a museum, the holotype of the species Alioramus remotus. This scrappy set of bones, which include various pieces of the skull and only a few fragments of the postcranium, was described by Kurzanov over 30 years ago. However, this specimen is fragmentary, has only been briefly described and poorly figured, and has largely been inaccessible to visiting researchers. As a result, Alioramus has remained a conundrum. It is clearly very similar to Tyrannosaurus, Tarbosaurus, Albertosaurus, and other tyrannosaurs. However, is it a tyrannosaurid proper (a member of the large-bodied, Late Cretaceous radiation of tyrannosaurs)? Is it a more basal member of the tyrannosauroid stem that survived until the Late Cretaceous? Or, perhaps, is it just a juvenile of Tarbosaurus? For 30 years we’ve known that only new specimens could solve this debate. Thankfully, that new specimen has indeed arrived. The skeleton we described clearly represents Alioramus, as it shares several unique features with the type of A. remotus. However, we have identified a number of differences between the two specimens, and hypothesize that ours represents a new species, which we call A. altai, after the Altai Mountains of Mongolia. What’s most important, however, is that the new specimen shows that Alioramus is indeed a tyrannosaurid proper, but one with a unique body plan. Our phylogenetic analysis finds Alioramus as deeply nested within the Tyrannosauridae, and as a member of the tyrannosaurine subclade that includes Tyrannosaurus, Tarbosaurus, and Daspletosaurus. In other words, it is more closely related to these taxa than it is to Albertosaurus and Gorgosaurus. However, among tyrannosaurids, Alioramus is very unusual. It has a very elongate, gracile skull, with numerous horn-like ornaments. Ornamentation and pneumaticity are extreme compared to other tyrannosaurids, but the longirostrine skull is very different from the deep and robust skulls of other tyrannosaurids. The massive, strong skull of Tyrannosaurus and other tyrannosaurids, as well as their peg-like teeth, strongly interlocking lower jaws, thick brows over the eyes, and deep jaw muscle attachment sites, together enable these animals to employ an unusual “puncture-pull” feeding style in which the teeth can literally crunch through bone. Obviously, Alioramus lacks all of these features and must have fed in a different way. And, Alioramus is small: it is only half the size of similarly-aged Tyrannosaurus and Tarbosaurus. In short, the new fossil is the first evidence that some tyrannosaurids departed from the “classic” tyrannosaurid body plan. Alioramus was a small, gracile, long-snouted carnivore. Why might this be so? Tarbosaurus fossils are found at the same site as the new Alioramus fossils. These two large predators lived alongside each other during the Late Cretaceous in Mongolia. Perhaps the novel body plan of Alioramus allowed it to coexist with its larger, stronger cousin. Our work on the fossil is just beginning. Stay tuned for two additional papers: a detailed description of the braincase (complete with lots of cool details discerned from CT scanning) and the full-on, gritty monograph of the entire skeleton. Until then, I would like to thank my co-authors, as well as the talented team of AMNH artists who brought the fossil to life: Amy Davidson for the exceptional preparation, Mick Ellison for photography, and Frank Ippolito for the skull and skeletal reconstructions. Loved the talk at SVP, Steve. I was very surprised to see where Alioramus fell out phylogenetically. There wasn’t time to ask this at the meeting, but do you think the “horns” on Alioramus’ nasals are actual horn cores or just evidence of a very rugose surface texture? Thanks for your compliments, Zach. Glad you enjoyed the talk! The nasal “horns” are discrete structures, much more defined than the more random rugosity in all other tyrannosaurids. But, with that being said, they aren’t in the same ballpark as the jugal horns, which are big, conical projections that almost surely supported a keratin horn. Ditto for ceratopsian horns, bovid horns, etc.! My suspicion is that the nasal “horns” may have supported small keratin projections, but not huge, discrete horns. They are probably evidence of a very rugose surface texture, but I suspect that this region was covered in keratin. The nasal “horns” on Alioramus remotus are even more pronounced and more numerous. So, this sort of nasal ornamentation seems to be an Alioramus feature. A. altai is a juvenile or an old one? What an amazing specimen, Steve! This year is being great for tyrannosaurs! And for your team! Congratulations! I can’t wait to read that paper! Mark, good question. A. altai was nine years old when it died, still as a rapidly growing sub-adult. We determined this by examining thin sections of several bones and counting growth rings (LAGs). The A. remotus holotype is almost the same size as the A. altai holotype, so it is also probably a subadult. What is important is that, armed with an exact age (nine years old), we can compare the size and features of A. altai with those of nine year old Tyrannosaurus, Tarbosaurus, etc. And it turns out that A. altai is about half the size of a ca. nine year old Tyrannosaurus. A quick question about your skull reconstruction, which occurred to me while watching your talk at SVP. If the mandible were correctly articulated with the skull, it would appear that the lower jaw is substantially shorter than the skull, a discrepancy that becomes greater if one takes into account the missing premaxilla. Indeed, it looks as though the rostral tip of the mandible would be in line with the third or fourth maxillary tooth when the jaws were fully closed, giving this critter a substantial overbite. Do you think this a genuine feature or does it result from some kind of artefact in the reconstruction? Other tyrannosauroids don’t seem to have such a marked overbite. Very good point, Paul. I was wondering when somebody would raise this issue. Very discerning eye–perhaps you should become a theropod worker as well! To answer Paul’s question: yes, this is a bit of a mystery. There is no doubt that there is a discrepancy, and these things sometimes creep into reconstructions (which are models and not actual specimens, after all). However, in this case we looked long and hard and couldn’t quite pinpoint the problem. Frank, our artist, drew every bone individually under the camera lucida. And I suspect this is where the problem crept in. Because the bones were drawn individually, they were not sketched in articulation. I suspect that the joint between the dentary and postdentary bones is a bit too tight, and would have been much looser (and hence the lower jaw longer) in life. Additionally, it is possible that the quadrate is rotated posteriorly a little too much, and would have been swung a bit more anteriorly in life (also cutting down on the overbite). And, finally, tyrannosaurids do have a quite substantial overbite, especially compared to other theropods. Factoring in these three things (looser lower jaw joint, rotated quadrate, genuine overbite), I think a number of things dominoed to created the massive overbite. We tried to correct this, but it just wouldn’t work with the camera lucida drawings. In the supplementary information, the holotype was determined to be ontogenetically between the Nanotyrannus and Dinotyrannus holotypes. Yet glancing at the data matrix, it seems the codings don’t correct for its young age. For example, the orbital process of the postorbital is coded as absent, but this is true in Nanotyrannus’ holotype and all young tyrannosaurs. If it is truly subadult, it should be coded as unknown in case it developed the process in adults. Otherwise, considering how ontogeny and phylogeny map in tyrannosauroids, it’s going to be placed more basally than it should be. Perhaps if it (and A. remotus) were coded as a subadult, it would be closer to Tyrannosaurus and Tarbosaurus, or even sister to the latter? Yes, Mickey, that’s true. We didn’t “correct” our scores in the phylogenetic analysis to take into account the young age of the specimen. As far as I know, these sorts of “corrections” have never really been done, or have been done very rarely or in more of an informal manner. Why? I suspect because they would introduce some substantial assumptions into the analysis. We don’t KNOW if an adult Alioramus would have had an orbital process of the postorbital. True, juvenile Tyrannosaurus does not have one and adult Tyrannosaurus does. But, that doesn’t mean the same sequence is seen in Alioramus. Until we have a growth series, like we do for Tyrannosaurus and Tarbosaurus, we will never know for sure. Ideally we would only include adult/mature individuals in our phylogenetic analyses. That’s often the case in neontological morphological analyses. But, with fossils we rarely have that luxury. I prefer to use the data that we actually have, be honest and open about it, and reconsider our hypotheses as more specimens become available. In the case of Alioramus, I think it’s significant that Alioramus still comes out as a very derived tyrannosaurid (a tyrannosaurine) despite its young age. Maybe an adult would come out as slightly more derived, but even a juvenile has enough characters to come out strongly as a tyrannosaurine. I’d argue it eliminates assuptions in the analysis. At the moment, you’re assuming adult Alioramus looked like subadult Alioramus. By scoring ontogenetically variable characters as unknown, you’re not assuming any adult morphology. I was surprised the paper didn’t modify Alioramus’ codings because your coauthor Carr (2005) did exactly this in chapter 5 of his thesis. He found the juvenile Shanshanosaurus was sister to Tarbosaurus + Tyrannosaurus when age was not taken into account, but sister to Tarbosaurus when age was dealt with. Similarly, the Nanotyrannus holotype was found to be sister to Daspletosaurus + Tarbosaurus + Tyrannosaurus if age was ignored, but sister to Tyrannosaurus when he modified the codings due to it being young. Since this is exactly the position you found the similarly aged Alioramus to be in without taking its age into account, there would seem to be the incredibly likely possibility that Alioramus actually has a more derived position within Tyrannosaurinae. Your paper even said the nine year old Alioramus “has a set of features predicted for a ca. nine-year-old juvenile Tyrannosaurus.” I would go so far as to say the analysis in the paper can’t tell us anything about where in Tyrannosaurinae Alioramus belongs. I agree it’s significant that subadult Alioramus emerges as a tyrannosaurine, and think this is good evidence for it belonging in that clade. But beyond that, who knows where it goes. I am not familiar with Carr’s PhD thesis. I knew, of course, that he wrote a thesis, but I have not seen it nor read it. Same goes with most theses–no time to wade through hundreds of pages of dissertation work when there are published papers to be read. But that’s interesting that Thomas did this. This may be an avenue we can explore further, as we will have future publications on Alioramus (two monograph-level papers are nearing completion). With that being said, I am a bit skeptical about the dangers of overcorrecting. Many, many cranial features in tyrannosaurids are ontogenetically variable. There is the real possibility of throwing away too much data if we just score everything that is ontogenetically variable as unknown. And let’s put this in a bit of perspective. We are talking about a very minor issue here. At most, these corrections may move Alioramus one or two nodes higher in the phylogeny. The most important result is that it is a tyrannosaurine–this is clear even though the two specimens are immature. Maybe it’s the sister taxon to Tarbosaurus. That would be very cool. But I suspect that we’ll have to wait for some adult specimens to be more certain. Steve, I am loghtly surprised at the attitude that any specimen, even certainly juvenile, should be coded as is into a phylogenetic framework. The resultant phylogeny and presumably the intention of the tree produced thence is to attempt a picture of relationships, no? If so, then placing juveniles that show transformation and character changes or appearances during ontogeny into the same standing as adults obscures or at the least presumes adult status for these taxa. Carr’s thesis does in fact test this model and finds it curious why we should place juveniles in trees at all. This is more and more disturbing when some juveniles undergo phenomenal changes through to adulthood and have also been taxonomically ensconced, as in Ceratopsia or Hadrosauroidea; placing these taxa on equal footing with adults would therefore be like placing tadpoles in trees with frogs, or caterpillars with moths (which was taxonomically the case with larval and pupal forms of non amniotes in the past). Whoa, wait a second. I never said that we should just throw juveniles into phylogenetic analyses without any careful thought! That’s absurd. We’re talking about Alioramus altai here, which is a ca. 9 year old individual that weighed several hundred kilograms and was about four or five meters in length. We’re not talking about a tiny hatchling like Scipionyx. I am NOT saying that we should just throw juveniles into phylogenetic analyses, but with Alioramus that’s all that we have. My issue is with “correcting” the scores for Alioramus based on information on the growth series of OTHER taxa. I am somewhat uncomfortable with this because it relies on assumptions that remove the character scores from the actual states we observe in the taxon. From my perspective, it is best to just score it as is and see where it falls out. Here, it falls out in a quite derived position despite its juvenile status. Isn’t that informative? Doesn’t that tell us something quite interesting? Carr, Thomas D. 1999. Craniofacial ontogeny in Tyrannosauridae (Dinosauria, Coelurosauria). Journal of Vertebrate Paleontology 19(3):497–520. So, if I’m understanding correctly, Jaime, you’re suggesting that we not even bother with a phylogenetic analysis since the A. altai holotype is not fully grown? And the same with Raptorex? I think this is a rigid viewpoint. I agree that these analyses are not the final word on the phylogenetic position of these animals–for that we’ll have to keep revamping our phylogenies as new specimens (especially adults) become available. But in each case the phylogenetic analysis tells us that the animals are quite derived, and this is an important result. For instance, there has been much debate over the position of Alioramus (basal tyrannosauroid vs. Tarbosaurus juvenile vs. tyrannosaurine). Even though our analysis has its caveats, I think we can legitimately exclude a basal tyrannosauroid position and lend support to Currie’s idea that it is a more derived tyrannosaurine. Even a juvenile can tell us this, and that’s one reason why it’s important to go ahead with the phylogeny instead of throwing up our hands and giving up. Regarding the point of Alioramus being a tyrannosaurine, Andrea Cau recently included the Xiongguanlong codings you excluded from the final analysis and found Alioramus to be in a polytomy outside Tyrannosauridae. 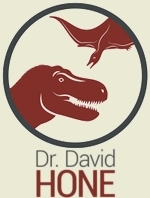 He makes a good point that taxa shouldn’t be excluded just because they create polytomies, as long as they also have unique combinations of characters, and especially when they change the phylogeny. Of course I’d argue the basal placement of Alioramus in that tree is probably due to age too. We didn’t just exclude Xiongguanlong from the phylogeny. We scored it for our character list, included it in the analysis, and discussed the results. True, we didn’t figure it in the text figure, but discuss the analysis in detail in the supplementary information. We did NOT exclude Xiongguanlong simply because it created a polytomy. As we discuss in the supplementary information, we do not feel confident that we have good enough character sampling near the base of Tyrannosauroidea to accurately figure out the phylogenetic position of Xiongguanlong at this time. The specimen was only described a few months ago, in a short paper and with only a few figures. I have not seen the specimen and we could only score it from the literature. On the contrary, I have seen Dilong, Guanlong, Eotyrannus, and Dryptosaurus, so I have more confidence in those taxa. Please, please, please be patient. Tyrannosauroid phylogeny is a large part of my thesis and we are working on a more complete analysis right now. These things don’t just come together overnight. It takes years of carefully observing specimens, taking photographs and making drawings, making comparisons, etc. I wish we could have incorporated Xiongguanlong better into the Alioramus phylogeny, but the paper was written and the first run of the phylogeny was complete when Xiongguanlong was published. Eotyrannus, Appalachiosaurus, Dryptosaurus, and Tyrannosauridae. I don’t know why our results are different from Andrea’s, but suffice to say, if our analysis recovered what Andrea recovered (i.e., Xiongguanlong messing up the phylogeny) then we would have handled it differently! When I tested Brusatte et al. full data-matrix present in the supplementary information, including _Xiongguanlong_, PAUP was not able to perform the phylogenetic analysis because the program cannot recognise the OTU _Allosaurus_. I don’t know why it happened. Then, I deleted that OTU, and the analysis produced the topology I showed in my blog. So, that result is linked to the omission of one of the outgroups from the data-matrix: given that this relatively little change in taxon sampling produced a phylogeny very different from the one published in Brusatte et al. (2009), I think that the current status of tyrannosauroid phylogeny is strongly influenced by taxonomic sampling artifact. I hope future phylogenetic studies would avoid both character and taxonomic omissions/artifacts.